COMPASSIONATE CLIMATE ACTION: You CAN Handle the Truth! You know what? We're in a no-analogue Catch-22. Psychologists tell us not to tell people the full truth about the climate change emergency because they won't be able to handle it and will shut down and not do anything. But if we don't tell people the full truth, they're not going to do anything anyway! I've recently asked readers and friends for advice on how to handle this conundrum. Below is some of the feedback I've received, and then I'll give you my new take on all of this. Unknown shared this: "I say go ahead and tell the whole truth, don't sugar coat it. You'll get people more scared, but maybe a little fear is what we need -- along with a heaping dose of reality. People are still WAY too self-absorbed, or worried about which celebrity is divorcing who, or which sports team scored higher than another. They need to realize that none of that matters at all, that their world is crumbling around them and they're too blind (or busy watching television) to see it." So, truth as wake up call! That resonates with me. Unknown finishes with "So bring it on, sister!" "Back in the days of Simon Charlie's Festival of the Sun, there were always people showing up and taking too much of the wrong thing ... bikers on tequila, kids on shrooms, acid, whatever ... and you know, my learning then, which has not changed much over the years, was and is that people get through their freak-outs if someone will just invest the time and energy to talk to them, calmly, openly, compassionately, in a way that lets them know you are not going to up and leave them stranded there." And patients who have just received a terminal diagnosis don't jump into action -- they have to digest the news and grieve a bit first. Then, however, according to my husband-the-doctor, they are ready to jump into action, to do whatever it takes to change their prognosis or prepare for the end. My husband-the-doctor and I have had many conversations about the psychology of climate change communication. There is just a small handful of psychologists who have driven the don't-tell-the-truth-about-climate-change agenda here in North America (and in the UK, too, I think). We suspect these psychologists weren't alive before World War II, so they haven't witnessed how the people in our culture can rally together when necessary. Nor have they worked in medicine to witness the courage of people who discover they are terminally ill. It's not that people (in our culture/society -- it's frustrating when psychologists talk about "people" as though they mean the whole human species when their research has dealt only with Americans; and even there, check out the Yale study Global Warming’s Six Americas) can't handle the truth. It's that people need someone -- their doctor, a Winston Churchill, their president or prime minister, a Climate Reality Project leader, ahem -- to be there for them once they've absorbed the truth. Furthermore, the truth does need to be the full truth (for example, the history of the denial machine) so that cognitive dissonance doesn't set in. You know, "the state of having inconsistent thoughts, beliefs, or attitudes, especially as relating to behavioral decisions and attitude change." In other words, if people finally come to see the urgency of what really needs to happen in the world but still don't see their leaders taking action, that's going to mess with their minds unless they understand all the forces at work to keep us embroiled (pun intended!) in the fossil fuel economy. And finally, here's my epiphany for the week (keeping in mind that sometimes my epiphanies are things I figured out long ago and then forgot about ;-). When "common knowledge" says that people can't handle the full truth about the climate change emergency, that they'll shut down and become immobilized, there are quite likely two flaws in that thinking. First, it's quite possible that the researchers (including the armchair variety) who tell us this are simply projecting their own fears and attitudes onto the rest of us. Second, that view of the human spirit forgets that we've really only been taking people to the door to peer in. We haven't yet been taking people right in, inviting them to sit down, and introducing them to the emergency in a way that allows them to calmly get to know it. We haven't yet asked them to feel deeply the plight of others in more climate-change-vulnerable regions of the world -- or their own country. We haven't yet put a box of tissues on the table next to them and encouraged them to cry their pain or sing a song of lament (the lost art in our society of passionately expressing our grief or sorrow) that will surely bubble up once this new knowledge is deeply understood -- and felt. And we haven't yet urged the perfectly natural anger that parents will feel once they realize their children's future is literally at risk because we're not willing to make the switch to cleaner, safer, healthier, more peaceful and more equitable perpetual energy technologies. 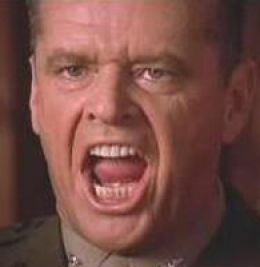 So no, unlike Jack Nicholson in A Few Good Men, we do not have the right to tell our fellow citizens that they can't handle the truth. We've never given them the chance.